In the spring of 1939 the Germans had their radar system working, Freya, and were curious if other countries had perfected this technology. German intelligence had discounted the French, Polish, and Soviets, but was worried about the British. It had been noticed that they were building 350-foot steel towers on the eastern English coast for some unknown purpose. 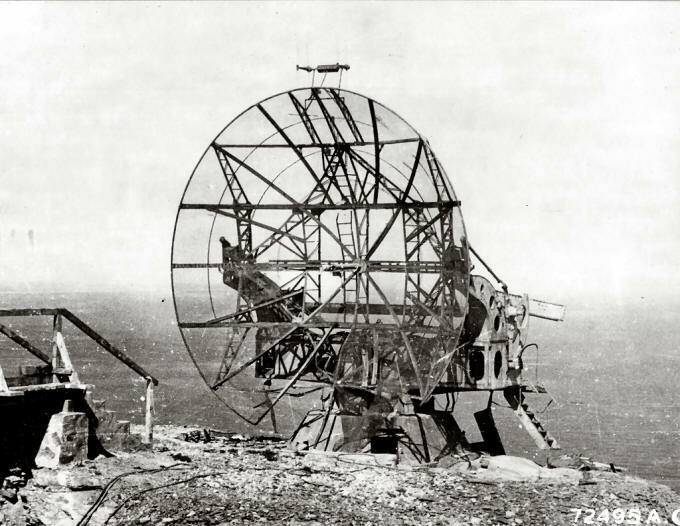 The Germans had discounted that this was radar, since these antennas were not optimal for the radar frequencies that they were using. On the other hand General Wolfgang Martini, the Luftwaffe director general of radio signals, wanted to know what they were. German intelligence activities included Lufthansa aerial photos and an invasion of German tourists, who liked to sightsee and camp around Bawdsey Manor, the headquarters of the British research establishment, with portable radio equipment. All this intelligence revealed was that the towers were producing strong radio emissions and that there was a lot of activity around the manor. Frustrated with these inadequate reports, Martini requested funding for twelve Zeppelin airships to monitor English radio signals. The Zeppelin was the only vehicle which could carry the required equipment and hover in place to take detailed measurements. Göring was not overly impressed with request and did not want to fund the project, but Martini out manoeuvred his boss and convinced the Secretary of State for Air, Erhard Milch, that this was a good idea. Milch agreed to release to Martini two dirigibles. Martini made two Zeppelin flights to England, but did not discover the secret of British radar. On the first flight in May of 1939 the crew did not observe anything significant, but noted loud continuous radio static source. The crew discounted this to be a fault in their radios. The second journey in August was just as disappointing because on that day the British radar chain was turned off to fix a malfunction. What is interesting is that instead of a radio malfunction on the first trip, the crew was probably receiving the static created by the British using high frequency (HF) for its radar signal. The Germans, early on, had discounted HF as a usable frequency for radar and concentrated on the VHF and UHF ranges. The capabilities and doctrine of the Luftwaffe was a product of its times. Political imperatives and economic shortfalls forced planners to embrace the offensive solution and forego funding a creditable defensive strategy. Lessons from Spain spurred the development of very capable bombing and navigation aids which allowed for accurate night bombing, years before the British developed such a system. German scientists had independently developed the most advanced radar designs to that date, but had to convince the military of its usefulness. Even when the systems were purchased, the Luftwaffe leadership failed to grasp its true utility and saw it in the limited role of an accurate gunsight. Only after their offensive strategy had failed during the Battle of Britain and facing an increasing Allied bombing pressure did the Luftwaffe rethink its strategy. Before and throughout the war, British ground radar technology was rather well matched by German scientific advances. The Royal Air Force came into being on 1 April 1918 in a whirlwind of wartime development. From its beginnings, the RAF adapted to reflect its times and political realities. Lord Trenchand, the first and longest serving Chief of the Air Staff, ensured the survival of the embryonic air force. Trenchard, in the early 1920’s, had to prove that the RAF was cost effective and touted its benefits in maintaining colonial influence through revolutionary ideas such as air occupation to control large areas of territory. He also viewed air power as a way to attack an enemy’s moral will and avoid the costly ground campaigns associated with previous conflicts. Trenchard stated in 1928 that the air arm would be “best employed behind the battle zone at the sources of supply, communications, transport, and national morale.” RAF strategists seemed to allude to the fact that strategic air power could win wars alone and pursued doctrine along those lines. Trenchardian air theory would permeate the RAF, guide its organization and focus up to 1939, and throughout the Second World War. As the air threat from Germany increased, the Air Ministry argued that Britain needed to increase its emphasis on the air counteroffensive and that strategic air power’s ability to deliver ‘massive retaliation’ was an effective deterrent against aggression. The only problem with this argument was that Britain was extremely vulnerable to air attack. The Luftwaffe’s exponential growth in the 1930’s challenged the RAF’s ability to deliver a knockout blow or a credible counter offensive. In fact, the Luftwaffe’s rise imposed the spectre of the Germans delivering the classic strategic knockout blow to the RAF. The Air Staff’s reliance on a strategy of deterrence and counterattack started to worry government planners. As Britain entered the 1930’s civilian planners felt that there were only three possible strategies: First, follow the advice of the Air Staff and develop a bomber force large enough to be a credible deterrent; a second, and less likely course was to get rid of the bomber through international arms control agreements or, thirdly, to challenge the air theory directly, and pursue an effective deterrent against air attack, using recent developments in fighter aircraft and aircraft detection technology. The financial burdens of trying to maintain a strategic parity with the Germans threatened to bankrupt the military budget and the diplomatic failures in arms control forced the government to adopt the third strategy. Lindemann was not alone in his opinion with Winston Churchill strongly supporting his position. The result of the political debate against the RAF policy of strategic interception, an offense only strategy, and the defeatist attitude, of the bomber always gets through, resulted in the formation of a Committee for the Scientific Survey of Air Defence with a Henry Tizard as Chairman in November 1934. The committee was interested and in February Watson-Watt presented his memorandum on the “Detection and Location of Aircraft by Radio Methods.” A short twelve days later he successfully demonstrated his concept. He was able to detect a Heyford bomber flying towards Daventry at a range of eight miles. This breakthrough has been hailed as the birth and invention of radar by numerous historians. During the year of 1935 Dr. Watson-Watt perfected his new technology of radar moving his main research centre to Bawdsey Manor. His successes led him to propose a chain of radio detection stations spaced twenty miles apart around the coast. The positions of aircraft were to be established by triangulation from adjacent receivers. The Air Staff funded twenty of these stations and seven were in operation by August 1936. This was the beginning of the Chain Home (CH) radar network. The CH station did not rely on new radio techniques, but drew on Watson-Watt’s experience with the British Broadcasting Corporation and high frequency (HF) radio. He proposed simple aerials on tall towers. The transmitter aerials ‘floodlighted’ the airspace in front of them with pulses of radio energy which, when reflected from an aircraft, was picked up by the receiver aerial. The range of the ‘echo’ was directly measured on the face of the cathode ray tube and the position of the target could only be ascertained through triangulation from other stations with a radio direction-finding instrument, a goniometer.